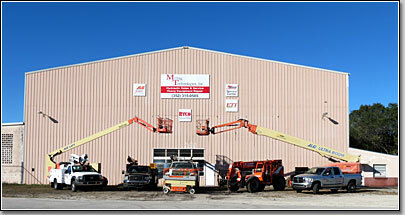 Milling Technologies Inc., in Fruitland Park Florida, specializes in hydraulic equipment sales and service. 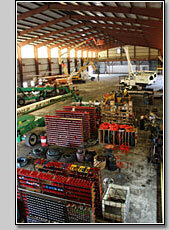 We service all aspects of Utility Equipment, JLG Lifts and Yard Dog Spot Trucks. We carry RYCO Hydralic Hose and Fitting Products as well as a wide variety of parts for forklifts, bucket trucks, snorkel trucks, hydraulic diggers, scissor and personnel lifts. Milling Technologies Inc. was established in 2002 with one employee. Through dedicated customer support, we have continued to grow by providing a multitude of services to our customers throughout Florida and the Caribbean. We are a general hydraulic repair facility that has become an industry leader in repairing utility equipment, man lifts and all-terrain forklifts and spot trucks. We can provide service at our 44,000 sq. ft. facility or on the road anywhere in the state and most of the Caribbean. We strive to reach customer satisfaction through quality service at a fair price. This philosophy has allowed us to grow throughout the current recession while most were cutting back. Located in Fruitland Park on US Highways 441 & 27, we are just minutes from the Florida Turnpike, I-75 and Hwy 301 all of which directly leads to any region of the state with minimal road changes. We are a stocking distributor of RYCO hose products from 1/4" 2 wire up to 2" six wire hose and fittings. This allows us to fit each hose before it is installed on your equipment for a neat and professional looking finish with a world quality product. Stocking 1000's of hydraulic seals in standard and metric allows us to reseal cylinders rapidly and effectively, many the same day, most within 24 hrs. For those larger than average cylinders, our cylinder table has over 30,000 ft-lbs of torque and ability to clamp onto a 10" nut. We have had customers fight larger piston nuts for days with multiple men working on it only to bring it to us to break loose in 15minutes. When it's time to look to purchase a piece of equipment, we can travel to inspect the equipment and give a written summary with photos informing you of the actual condition of the equipment. We have assisted several customers with our honest straight forward approach. We have one customer located out of the country who has bought or passed up several pieces of equipment on our word. We do this by Listening to you, so we can understand your expectations and plans with the equipment. We then give our opinions and facts about the equipment. The final decision is yours, but you are armed with an honest unbiased opinion about the piece of equipment. We have a close working relationship with a company that can assist in shipping to almost any port in the world and have worked with companies to prep their newly purchased equipment for port. If you're looking to sell your equipment, rejuvenate it or make it like new we can assist. Through a simple going through and fixing the majors to making it like new, we can handle the task. We have mechanics that have decades of experience, most having their area of specialty. These talented employees have been key to our success. Their ability to make things happen when others only see defeat puts us ahead of most of our competition. When others said it couldn't be done not only have we stepped up to the plate, but have hit home runs. When you have equipment that is critical to time sensitive operations, we can develop a plan and execute it. This was shown when Walt Disney World had ride critical JLG 660SJ's that needed a 7 year inspection conducted between the time they shut down and started up the next morning without fail. They gave us 10 hrs, we were done in 7. Florida Aerial Hydraulic Equipment Service | Hydraulic Equipment Repair Service | Aerial Bucket Truck Repair Service | Contact Milling Technologies, Inc. Hydraulic Digger Repair Service | Hydraulic Equipment Repair Service Links | Hydraulic Equipment Training and Consulting | Milling Technologies Inc.